We always have fennel seeds in the spice rack because I cannot make (Italian) Sauce without including it. Fennel seeds also make a great soup like this one. This soup is deliciously fragrant and tasty to eat. *If you poach chicken or chicken parts, place that poaching water in the icebox. The chilled Schmaltz (chicken fat) will firm up on the top and is a fabulous flavouring agent. However, if you must, substitute with butter. This looks delicious! I've never really had fennel before, so I might try this for something new! Great post :) Happy weekend! Fennel sounds very interesting in this dish... I use fennel and it also works great for babies with colic. Hi Anthony. I didn't know that chilled chicken fat was called schmaltz. The soup looks delicious. NIKKI: This soup is exquisite. You have a great weekend too. MY JOURNEY WITH CANDIDA: We love this soup because it is unique. SUSANNE DRAZIC: Yes and schmaltz adds a wonderful flavour to a lot of dishes. are fennel seeds kinda licorice tasting---looks wonderful! Another I did not know, sure have a soup list now. I've never eaten fennel, that I can think of. Sounds like an interesting recipe! this looks like a great recipe! can't wait to try it, and can't wait to see what you come up with next! I am a follower now. 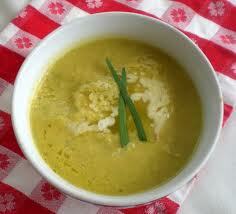 LYNN PROCTOR: Yes have an anise flavour and makes this soup special. PATT HATT: Hope you like soup dishes rhymeman, please call again. THE GOLDEN EAGLE: Fennel is used in Italian sausage, I use it in tomato sauce. RCH: Thanks for those complimentary words, I'm grateful. MOV: Thank You for visiting. I have nevr heard of Fennel soup before. It really looks good and I have been craving a good one too! JOANNE: You will enjoy this soup. A to Z soup? Get out! I love soup! I will check back for more deliciousness. I love your recipes, because most seem very healthy. And original. PBR is Pabst Blue Ribbon, btw. Current beer of hipsters, but used to be the beer of working class men, back in the 70s. JENNY: I'm happy that you like soup. Stick around for more. DAWN @ LIGHTEN UP: Ok, heard of that but thought the hipsters were imbibing Samuel Adams. Thank you Dawn for your kind words. SHUTTERBUG: I agree with you and appreciate your comment. Looks tasty, might try it with veg stock.